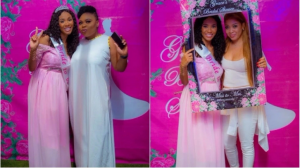 Famous fashion business and Nigerian designer, Yomi Casual’s fiancee, Grace held a lavish bridal shower party recently – The party which was well-attended by friends was in anticipation of her wedding to the fashion designer – Yomi and Grace met seven years ago and have been waxing strong since then As wedding bells sound for Yomi Casual and her fiancee, many pre-wedding events have been held in honour of the special day. 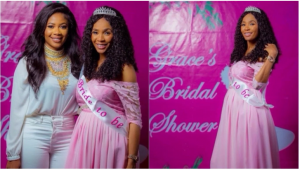 Yomi Casual and his pretty wife Grace first held a stylish pre-wedding shoot and now, Grace and her friends threw a lavish bridal shower as they prepare for the wedding ceremony. 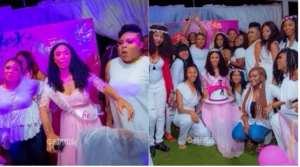 The bridal shower was a colourful ceremony that showed the playful side of the bride-to-be. 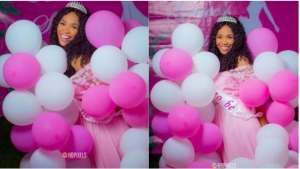 She dazzled in pink lacy dress and rocked a tiara. The lovebirds have been together for seven years and are still waxing strong together. The wedding day has been slated has been slated for October 14 and from the looks of it, they are going to have an amazing event just like this bridal shower. Many friends were present to celebrate with the princess of the day. They all looked glamorous in white and posed with the bride-to-be in multiple photos.